Among established All Whites and experienced New Zealand youth representatives, a handful of fresh faces have been called to join Darren Bazeley’s side for their FIFA U-20 World Cup Korea Republic 2017 campaign. Among the World Cup debutants is goalkeeper Conor Tracey, whose long and strenuous football journey has made his first call-up to the national team even more rewarding. “To wear the Fern on my chest, knowing I’m representing our entire country and everything that means to be a ‘Kiwi’, is a very uplifting feeling,” he said. “Considering I broke my leg two weeks before being named in the qualifiers then spent eight months trying to come back from that to prove I should be selected for the world cup; I think I was more proud of what I had just achieved than anyone else. Tracey has had the ball at his feet – or in his hands – for most of his life, working his way up the football ranks from humble beginnings at Auckland-based football clubs Papakura City FC and Beachlands Maraetai AFC – where he spent 10 of his most formative years. Tracey’s devotion to the game earned him a small stint with English Football League Championship club Queens Park Rangers in 2014 and 2015, giving the 17-year-old a real taste of the professional football environment and what reaching that level requires. “It was a great experience trialling overseas and playing at QPR was great experience,” he said. Joining his fellow Junior All Whites in camp, Tracey is enjoying being back in a high level football environment and learning from his experienced teammates, especially Sunderland AFC goalkeeper Michael Woud. “Having him here will greatly improve my game as he is playing and training in one of the greatest footballing nations in the world. Anything I can learn off him will benefit my game,” he said. “All the boys here are a great bunch of lads and the energy and enthusiasm radiates off everyone, which will make us undoubtedly the closest knit group at the World Cup,” he added. 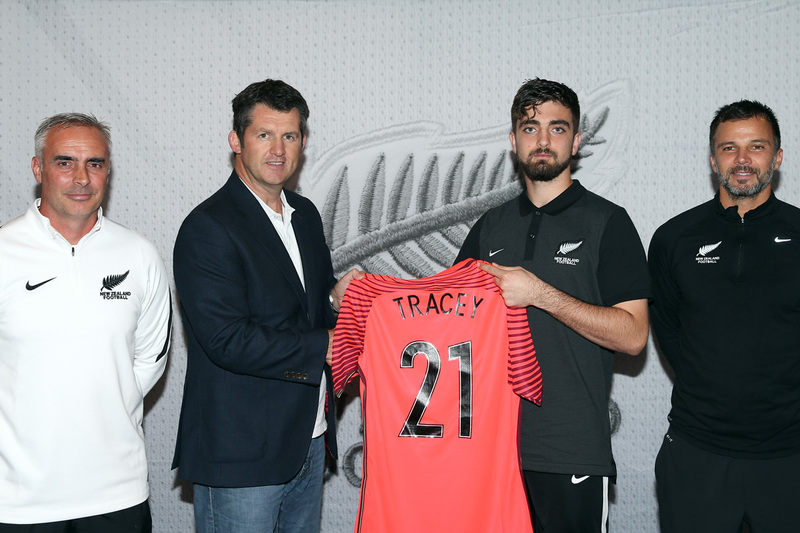 Counting down the final days before kick-off, Tracey is feeling confident about improving on New Zealand’s impressive FIFA U-20 World Cup 2015 campaign. “I believe we have a favourable draw and a good chance to get through the group stage,” he said. Although he has full confidence in his team, Tracey is preparing for an unpredictable and mentally-challenging encounter next Monday when they take on Vietnam in their first match of the competition. “I think the first game against Vietnam will be the toughest as we have never seen Vietnam in this World Cup before,” he said. “We don’t know what we are up against, and there will be the added nerves and pressure of it being the first game. New Zealand will play Vietnam in their opening match of Group E on 22 May before playing Honduras on 25 May and France on 28 May in the 2017 FIFA U-20 World Cup Korea Republic 2017.